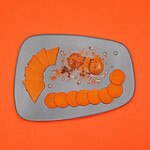 255/365 – “Metamorfoodist” nr.13, a photo by Luca Rossini on Flickr. Steamed Pumpkin Slices with Marinated Egg Yolks and Carrot Washers Bleached with Black Tea, Sprinkled with Paprika and Curry Powder (“Sfogliata di Zucca al Vapore con Tuorlo d’Uovo Marinato e Rondelle di Carote sbianchite al Té Nero, spolverata con Polvere di Paprika e Curry”). A reference to the “molecular” cooking with the egg yolk marinated for six hours in a mix of sugar and salt till the almost total hardening for dehydration. 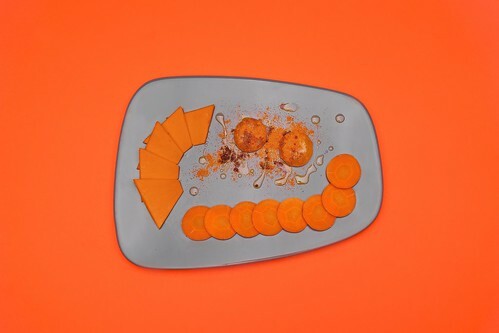 As side dish to the marinated egg yolk, as natural as a taste as it is peculiar to the palate, there are a few slices of steamed pumpkin and a set of carrot washers bleached in an infusion of black tea. To bond everything together let’s sprinkle the whole dish with a mixture of sweet paprika and curry.